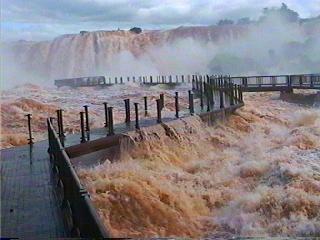 Argentina Discovery - National Park La Cruz pure missionary native forest with waterfalls and natural viewpoints. The Cross Theme Park is located on Cerro Santa Ana, 360 meters above the sea level. It takes place in an area of ​​57.5 hectares of native forest pure missionary, with waterfalls, native tree species, birds of the area, natural and attractive private balconies. A space that combines pure nature with architecture in perfect balance, facilitating access and tours through trails and sidewalks. The site chosen for the construction of the park enjoys a privileged panoramic position, ensuring excellent visibility of the landscape from all angles, fully articulating the main building with a series of activities planned for visitors. Hours belonging to 18 pm. Schedule: 10, 12, 16 and 18hrs. The proposed theme park first direct contact with nature through access to a privileged view of the highly endangered from a viewpoint of 82 meters high on the hill, become the "eye of the jungle". Also invited to take tours through the natural forest trails, outdoor activities, ecumenical religious celebrations, cultural events, observing the landscape (using the height of Cerro), bird watching and a particular knowledge of the flora and fauna the place from the planned infrastructure particularly for such purposes. Today, there have been 23 visitors (107 hits) on this page!